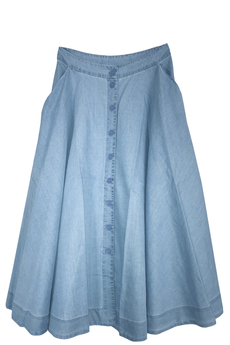 Sandy Sun Bleached Button Skirt is made from cool and fluid soft fabric which makes it perfect for summer. In washed chambray color features front button fastenings, gusseted side front pockets and is cut in classic circle shape. Is not lined and is approx. 80cm in length. New Summer 2019 Collection. Composition: 62% Cotton, 38% Tencel.